Live Texas Hold’em at bars & restaurants in your area. What could be better than playing a few hands of poker at your favorite Tap TV location? How about taking on players from around the country in a Texas Hold’em battle royale? That’s what Tap TV Poker is all about — and it’s free-to-play! Take a seat at an 8-player virtual table and face off against opponents in real time. Wagers, blinds, hole cards — it's all the excitement of Texas Hold'em at your favorite hang-out. Ready for the big time? 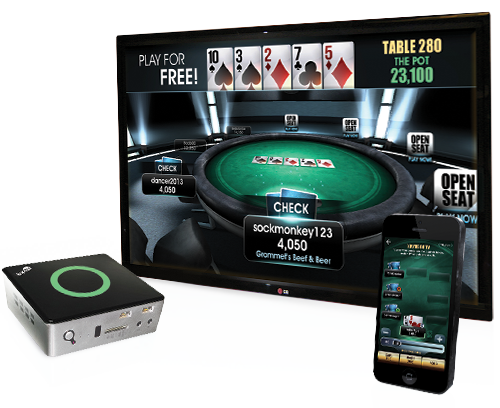 Tap TV puts your poker table on-screen for everyone to see.